The Libre Computer Board ALL-H3-CCs are H2+ / H3 / H5 powered development boards originally introduced via a Kickstarter campaign in 2017. Otherwise dimensions, component and port locations are identical. The boards are supported by both mainline U-Boot and kernels. Raspberry Pi model B+ compatible 40-pin, 0.1" connector with several low-speed interfaces. 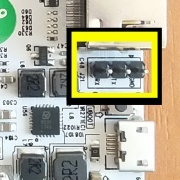 MicroUSB power is routed through 2A fuse (1F1). Connecting power through GPIO pins bypasses over voltage protection circuit. Each of USB-A jacks is routed through 500mA fuse (so you can not connect 1A HDD, also, you can not draw more than 500mA combined from the same dual-jack). H2+ and H3 boards supply single 1.2V to CPU using AXP8036 (1.1V on H5), which means maximum cpu freq is limited to 1008MHz. USB-OTG port is located in one of USB-A jacks. That's top left one on v1.0. The U-BOOT button next the the µUSB connector triggers the FEL mode. Blue LED (Status), connected to the PA07 pin. Green LED (Power), connected to the PL10 pin. Red LED, connected to the VCC3V3-IR. The UART pins are located between HDMI and power jack on the board. Marked on the PCB (simplified layout: ..board-edge..GND|TX|RX. Just attach some leads according to our UART Howto. This page was last modified on 8 December 2018, at 04:34.